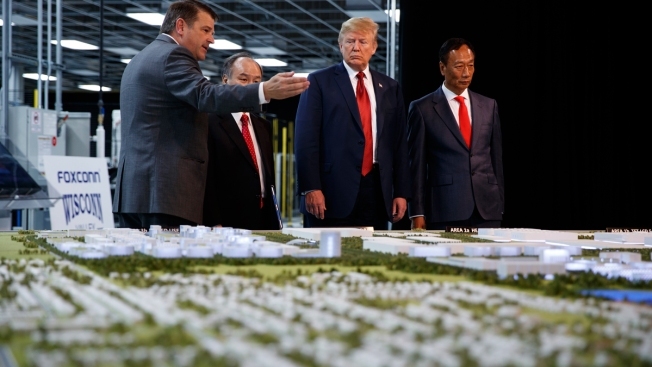 In this June 28, 2018 photo, President Donald Trump takes a tour of Foxconn with Foxconn chairman Terry Gou, right, and CEO of SoftBank Masayoshi Son in Mt. Pleasant, Wisconsin. Foxconn Technology Group has shifted its stated strategy yet again on Friday for a massive Wisconsin campus, crediting a conversation with President Donald Trump for cementing plans to proceed with building a factory to make high-tech liquid display screens.